Basic ingredients needed: sushi wrapper, cucumber, avocado, wasabi, ginger, salmon, yellowfin tuna, cooked shrimp, mayo, shicimi, ponzu sauce, eel sauce. How to make: 2 cups of short grain sushi rice, 2 cups of water, wash and rinse for a couple of times and soak the rice for 1 hour. Use the rice cooker or a pot of water over medium heat to cook the rice. Bring to boil, turn to low heat for 10 minutes and turn off the heat, cover and sit for another 15 minutes until the rice cooked. Making rice vinegar: 1/3 cup of rice vinegar, 2 TBS of white sugar, 1/2 tsp of salt, 1 tsp of dashi. Pour the vinegar mixture on rice and stir well. Let rice cool down for a few minutes until within the room temperature. 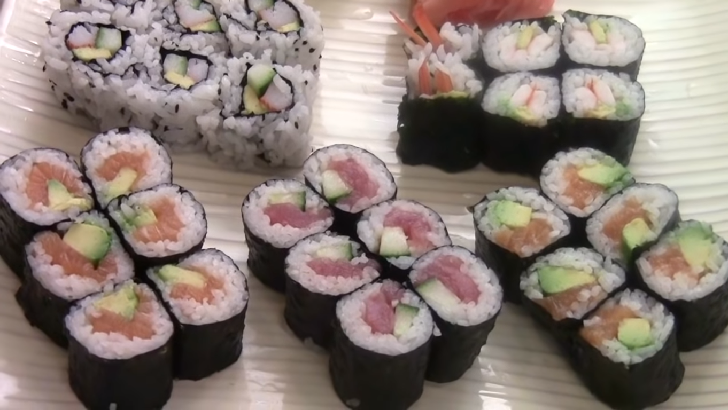 You can make: cucumber roll, avocado roll, salmon cucumber roll, salmon avocado roll, tuna cucumber roll, tuna avocado roll, shrimp cucumber roll, shrimp avocado roll. You can also add spicy mayo and drizzle eel sauce. Enjoy.